Universidade de São Paulo; São Paulo, Brazil. As most of you might have already guessed by the title, I am a nerd. As such, a relatively large part of my life was invested in hours of playing video games, reading nerdish stuff and playing tabletop role-playing games (RPGs). RPGs should not be confused with board games, card games or board wargames. RPGs require players to “create fictional personas (…) within the rules and genre specified by the game, and then collectively engage in protracted storytelling” (Williams et al., 2006). As such, though the dungeon master might give some rules, background information and create a whole world for the players to explore, playing RPGs and creating your character is quite an open experience, where the player can and should use his/her creativity to have as much fun as possible together with the other players. My experience with RPGs is mostly restricted to the Dungeons & Dragons system (D&D), which is probably the most famous tabletop RPG in the world. It was created in 1974 by Gary Gygax and Dave Arneson and, through the years, had many revisions of the rules, with new editions being published. Literally hundreds of books (Wikipedia, 2014) with new rules and classes were written to expand the ever-growing options for the players and dungeon masters. Also, D&D is remarkably less controversial than Storytelling RPG systems, with fewer parents blaming D&D for some sort of small disorder their children have, like a tendency to murder goats, summon cosmic horrors or whatever. On a D&D game, players form a group of adventurers (or party) and embark on a journey for wealth and glory. Inside a world created by the dungeon master, the players are free to explore dungeons, destroy castles, build cities, save princesses and be awesome. Obviously, this never happens, as players inevitably ends up doing stupid actions which usually gets them (and everyone near them) killed; but this is the fun of RPG, probably. 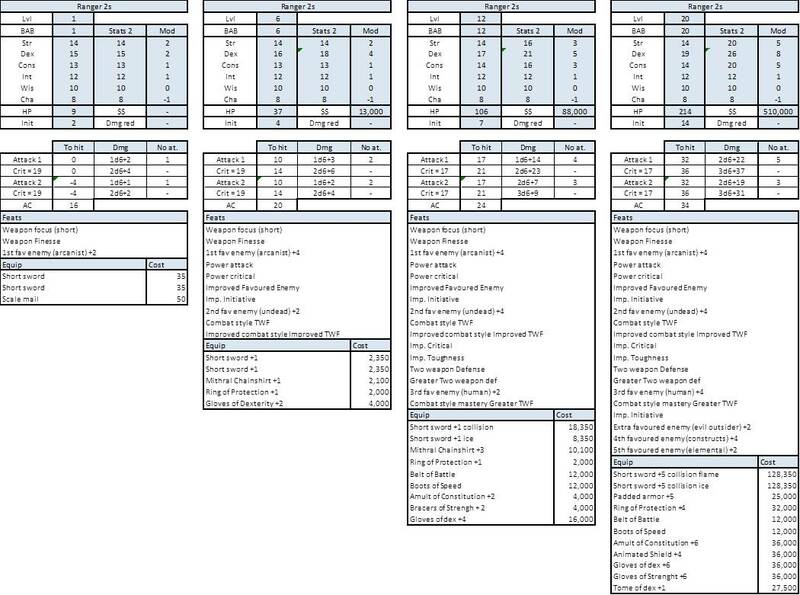 One can divide a typical D&D game in different stages. There are moments when the party is exploring a forest, gathering information in the middle of a big city, furtively invading a well-guarded castle or fighting a horde of beasts. The party, thus, usually have different characters with different roles to fulfill each task (or not, since teamwork usually is not part of the average D&D party). Battles are inevitable and an important mechanics of the game, with whole chapters of the rule books devoted to it. Because of all the above, some players end up reading lots of books to find nice abilities and build a good and useful character. Being a hopeless nerd, of course I’ve done that. Today, I will present what I like to call the “Munchkin Dilemma”. The word munchkin originated with the famous “The Wonderful Wizard of Oz” novel (often called simply “The Wizard of Oz” on the numerous reprints and the 1939 movie, which, by the way, recently made 75 years), written by Lyman Frank Baum in 1900. Munchkins are the natives of the Munchkin Country, and were originally said to be about Dorothy’s height. On the famous movie adaptation, though, the Munchkin Country was called “Munchkinland”, and the munchkins were depicted as being much shorter than the other Oz residents, being played by either children or adults with dwarfism. The word munchkin ended up entering the English language due to the popularity of the movie, as a reference to small children, dwarfs and anything of small stature, much like the Oompa Loompas. In RPG jargon, however, munchkin is a pejorative term used to depict the “power player”, meaning the player who tries to make optimized characters, using the many different books to conceive the most efficient, overpowered killing machine instead of a character fun to play with. I guess the reason they are called munchkins is because they play like children, though it would make a lot more sense if it was because they like to play with dwarves. They are despised by the other serious and mature adults who play RPG. There is a lot of prejudice associated with this term, of course. I expect no one likes making an useless character, but I guess that players that for some reason want to play with monks or bards tend to feel bad when a wizard does their job (much) better, and then they start complaining about not wanting to make a “power” character because they prioritize the roleplaying part of the game (they should be happy, though, since they are true to the uselessness of their characters). 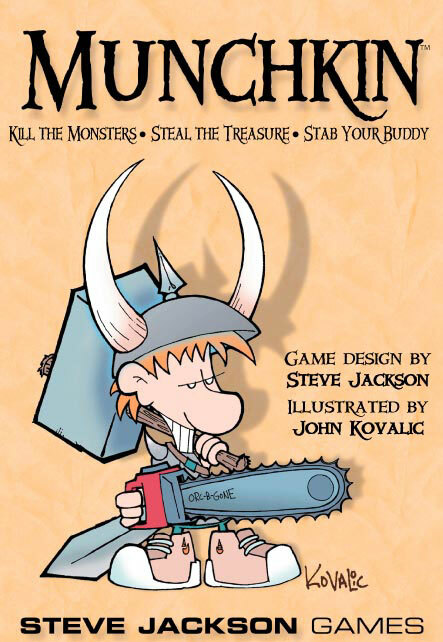 A card game created in 2001, where the player’s objective is to get to a high level while preventing the opposing characters of doing the same, was named Munchkin with the intent of making fun of such playing style (it is a great card game, by the way). “And my axe!” Art by Todd Lockwood. Image taken from: Dungeons & Dragons Player’s Handbook (3.5 ed.). Though there are many ways one player can be a munchkin, most of the times the munchkin’s objective is simple: to be a damage dealing, powerhouse chucknorresque machine. And to do so, he wants to have the strongest class, with the best configuration of feats and the strongest weapon. Usually, the best way to do so is with a complex combination of many classes, or with a cleric or wizard. An optimized fighter, for example, might fight with a spiked chain and use the Improved Trip and Improved Disarm feats to become a very strong, overpowered and forever alone hated fighter. 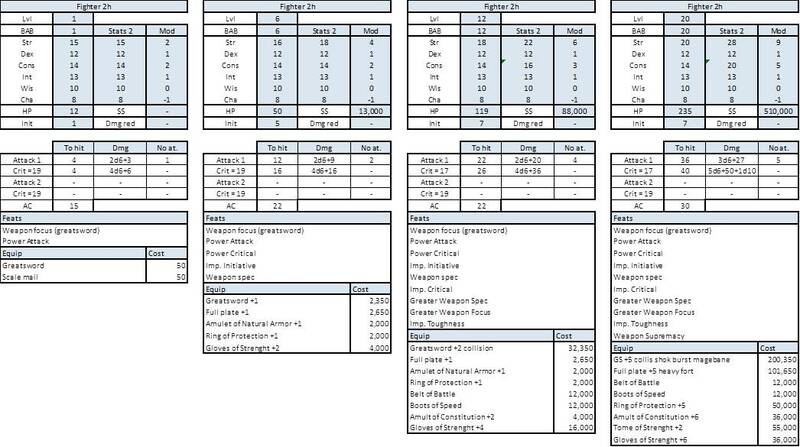 In an attempt to answer one of humanity’s most pressing questions, I decided to create characters with the melee classes from the Player’s Handbook, at different levels, with normal progressions (focusing on being strong at 1×1 combat) and equipment that corresponds to their expected treasure. The characters would then be tested against each other to see which one would have the best victory/defeat rate. The first classes chosen were: Fighter, Barbarian and Ranger. Though the morphed Druid is said to be the strongest melee, it is also: (1) not a usual munchkin class; (2) difficult to simulate because of the many resources (wild shape strategies, such as grappler, trampler and defender; animal companion; spells). So I decided to leave druids for later. At first, I wanted to add the Rogue just to see how well it would fare, but at lower levels he wouldn’t be able to use the keen rapier + telling blow combo and at higher levels he would likely face fortified armors, so it wouldn’t make sense. I added the Monk just for the fun. The Paladin and the Cleric were not chosen at first because they were either too specific against some enemies or way too complicated to simulate. The levels chosen were: 1, 6, 12, 20. Though it makes absolutely no sense to have a level 20 pure melee Fighter with a two-handed sword, I stipulated that there would be no multiclassing for the first experiment. The race for all characters was decided as human, so no one would have any obvious advantage. The fights are 1×1, with each character starting close to each other (avoiding charges and strategies of allowing the opponent to attack first and later using full attacks). The ability scores for each character were decided by using the “Elite Array” distribution suggested on the Dungeon Master’s Guide (Cook et al., 2003b: p. 169). The distribution of the scores is 15, 14, 13, 12, 10, 8 among the abilities, whichever way the player wishes. The abilities and the extra ability points gained on levels 4, 8, 12, 16 and 20 were chosen according to the classes’ strengths. Similarly, the feats were chosen in accordance to the classes’ characteristics. The money for each level was also taken from the Dungeon Master´s Guide (Cook et al., 2003b: p. 135), with the exception of the 20th level, where a random large amount of money was chosen (usually, a lot of the money at this stage goes to other random stuff not really necessary for battle). Also, there are different strategies the fighter might have. He can be the typical sword & board user, the two-handed weapon user, or the two weapons user. All three were considered in this study. The stats of each characters, as well as the feats chosen, are displayed on Table 1. Table 1. Character stats. I decided to leave it small because no one will read it anyway. Table 2. Fighter (sword & board). Table 3. Fighter (two-handed sword). Table 4. Fighter (two swords). Table 5. Barbarian (with rage, +6 level 1 and 6, +8 level 12, +10 level 20). Table 6. Ranger, two swords (favored enemy human: +2 lvl 12, +4 lvl 20). Though the monk was included just for fun, I had some problems on creating the character. Since this is an all-out damage battle, I excluded feats of disarming and tripping, which are great (though the monk is never great, thanks to his horrible BAB). So, to make things fair, I used some feats from the Tome of Battle book, which we usually don’t use because of the overpower stuff in there. Since the monk suffers from MAD (Multiple Ability score Dependency; damn, the monk is horrible), his money is spent on items for pretty much all abilities. One good equipment for the monk would be the Monk’s Belt, but it takes away the monstrous Belt of Battle. Damn monk, I hate thee. Table 7. Monk (considering 100% flurry of blows and Snap Kick on level 20). I decided to use a simulation method instead of analytically solving probability equations, because doing it analytically takes an absurd amount of time, since the number of combinations are enormous. To exemplify, I tried to make the Barbarian vs. Fighter (two swords) level 1 fight analytically. The terrible result is shown on Tables 8–11. The problem is that each attack has three possible outcomes (hit, miss or critical), the two-swords fighter, for instance, generate 2 to the third power possible outcomes with each attack. When considering more attacks and more health points, the number of combinations grow considerably. Imagine a fight of a level 20 monk against a level 20 ranger: the monk’s 7 attacks and the ranger’s 8 all have three possible outcomes. Considering the total HP, it is possible for the ranger to hit the monk 11 times without defeating him, while the monk can hit the ranger 14 times without defeating him. After the fighter’s second attack, I decided to extrapolate the results previously found to the remaining rounds. I believe I got close enough to the answer, but it took some effort. Thus, the barbarian defeats the two-swords fighter more than 4 out of 5 times. Table 9. Battle begins. 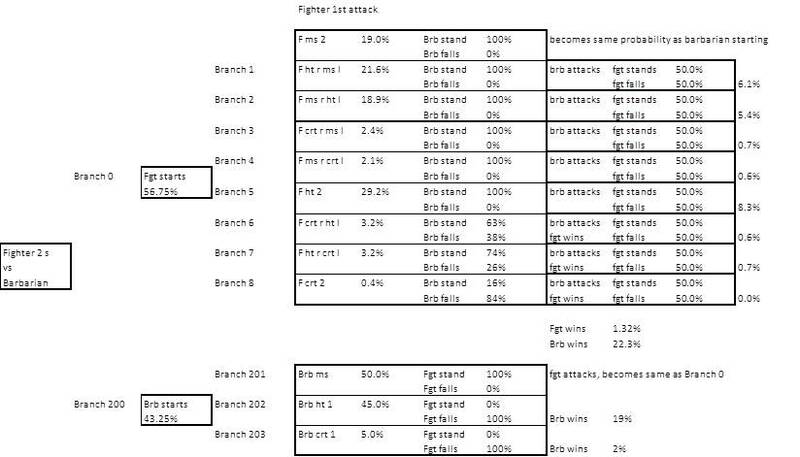 Notice how each branch where the fighter survives after a barbarian attack results in other 8 branches, with 8 possible fighter outcomes. Table 10. Fighter’s second attack. Table 10. Fighter’s second attack (cont). Table 11. Extrapolating the results and final result. Winning with initiative: how many fights this build won AND had the initiative. Also, henceforth, the sword & board Fighter, the two-handed sword Fighter and the two-weapons Fighter shall be called, respectively, S&B Fighter, THS Fighter and TW Fighter. On level 1, it is possible to see that the Barbarian had little trouble dominating all the other builds, with winning percentages higher than 70% against any opponent and an average of less than two rounds to finish a combat. This result is not unexpected, since the Barbarian acquires the very strong Rage ability on level 1. The Ranger and the Monk, on the other hand, performed poorly against all the opponents, and had a technical draw when faced against each other. This result also is not unexpected, since both classes have low hitting rates at the first level – the Monk’s flurry of blows is still underdeveloped and the Ranger does not yet acquired his first Combat Style class ability (two-weapon fighting). In the middle of the pack are the three fighter builds. The S&B Fighter, with his high armor class, managed to defeat the TW Fighter and the THS Fighter, while the TW Fighter defeated the THS Fighter. The three fights were relatively close. Table 12 shows the detailed results of the fights. Also, it is interesting to compare the results of the simulation with the ones calculated analytically on the first part. 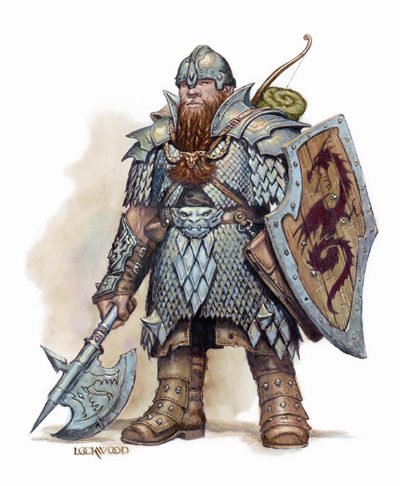 It was calculated that the Barbarian would defeat the TW Fighter more than 80% of the time, while in the simulation, it is seen that the Barbarian would win around 70% of the time. This difference shows that some of the simplifications adopted in the first part were probably incorrect. Table 13 shows some averages and consolidated results. It is interesting to see how having the initiative impacts the outcome of the fights. 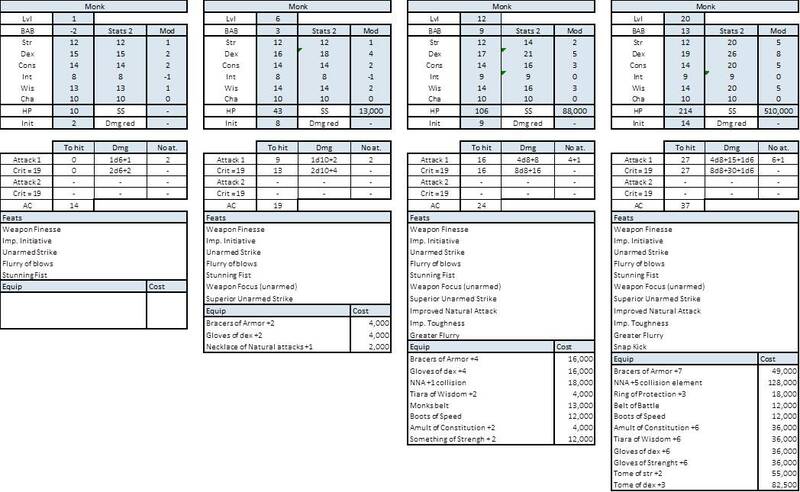 The Ranger and the Monk had most of their wins when they had the initiative, while the Barbarian had a very low number of defeats when having the initiative. Table 12. Results of the fights for the level 1 builds. Table 13. Some consolidated results for the level 1 combats. On level 6, once again the Barbarian defeated all the opponents. This time, though, he had a much harder time against all the Fighters, and the THS Fighter in particular. 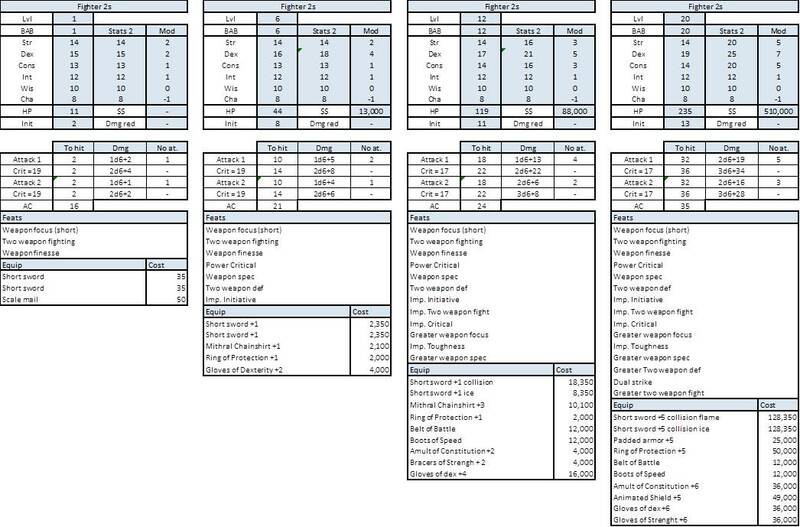 By level 6, the Fighter builds gained a lot of feats, mainly the Weapon Specialization, Power Attack, Power Critical and Improved Initiative ones, which made them considerably stronger. The S&B Fighter and the THS Fighter did very well against the other classes, and had a technical draw when they fought against each other. The Ranger and the Monk, on the other hand, dragged terribly behind the other classes. The Ranger’s strongest resource in a fight lies with her Favored Enemy ability and, for this simulation, this ability is only acquired against humanoid (humans) on level 12. The Monk suffers because of his lower Base Attack Bonus; by level 6, all the other classes have acquired their second attack, while the monk still has only one (without considering the flurry of blows). The detailed results can be seen on Table 14. Table 15 shows again some averages and consolidated results. Compared to the level 1 combats, the ones on level 6 took much longer due to the increase in Health Points, without much damage dealing improvement (which usually comes with stronger equipment at higher levels). 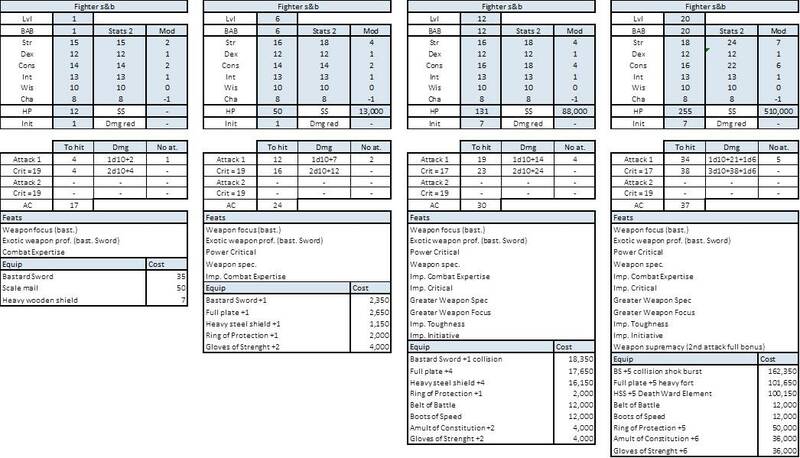 The builds that did better at level 6 were the ones that were capable of consistently dealing high damage with few attacks (THS Fighter and Barbarian), instead of many, easier-to-miss attacks and low damage. Once again, the initiative had a lot of impact on the results of the fights. The only outlier would be the Ranger who won most of her fights without the initiative (though most of them were against the monk). Table 14. Results of the fights for the level 6 builds. Table 14. Results of the fights for the level 6 builds (cont.). Table 15. Some consolidated results for the level 6 combats. On level 12, once more the Barbarian defeated all opponents without much trouble. Most of the merit can be given to a much higher number of Health Points, and mainly to the much higher damage output per round of the build (Greater Rage, Gloves of Strenght +4, Collision Weapon, Boots of Speed), which reduced his average number of rounds to finish a combat to less than two. In fact, at this stage the equipment starts playing a much larger role on the combats, allowing all classes to finish their fights in a much shorter time. The Ranger, once again, struggles to win even a small number of fights. The favored enemy ability is still underdeveloped and the two weapons are very expensive to upgrade. For this reason, the TW Fighter also does very poorly on this scenario where equipment is so relevant. The Monk, on the other hand, performs surprisingly well (I definitely did not expect the Monk to win a single fight!). Thanks to a fully developed Flurry of Blows and the Monk’s Belt, he is capable of dealing a lot of damage to builds with low Armor Class, losing badly only to the S&B Fighter and the Barbarian. Finally, the S&B Fighter convincingly defeats the THS Fighter and all the other opponents but the Barbarian. Thanks to stronger equipment, the S&B Fighter is capable of defeating the opponent quickly, while keeping a very high Armor Class. The detailed results can be seen on Table 16. Table 17 shows again the averages and consolidated results. The fights are much shorter thanks to the increase on damage output with the better equipment. It is clear that the initiative factor becomes even more impacting than in the two previous scenarios. A high percentage of the fights won by the Ranger and the Monk are when they have the initiative. This effect is also a consequence of the higher damage output. Table 16. Results of the fights for the level 12 builds. Table 16. Results of the fights for the level 12 builds (cont.). Table 17. Some consolidated results for the level 12 combats. Finally, on level 20, the Barbarian is once more completely dominant. With a monstrous amount of Health Points and damage output, he easily defeats all other classes and completely destroys the S&B Fighter, who is incapable of dealing enough damage. 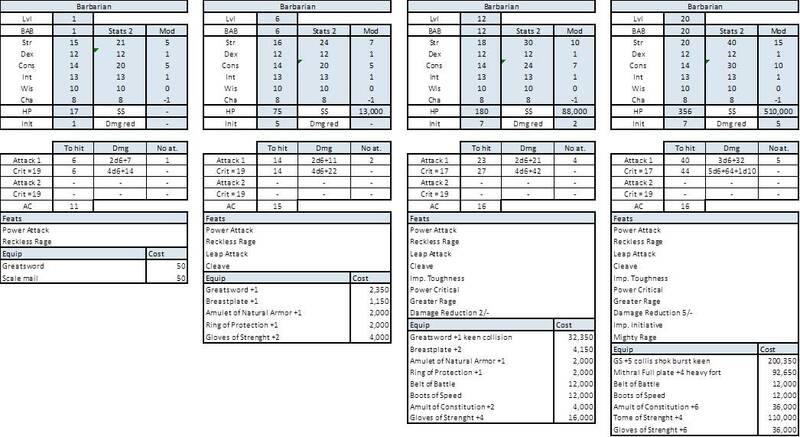 The S&B Fighter, though completely defeated by the Barbarian, overpowers all the other classes through consistent damage and very high Armor Class. The TW Fighter and the Ranger, with enough money to equip themselves, perform very similarly, defeating both the Monk and the THS Fighter. The Monk, once again, is crushed by the other classes. The Monk’s interesting feats and abilities are not enough to deal with increasingly powerful weapons and armors. The detailed results can be seen on Table 18. 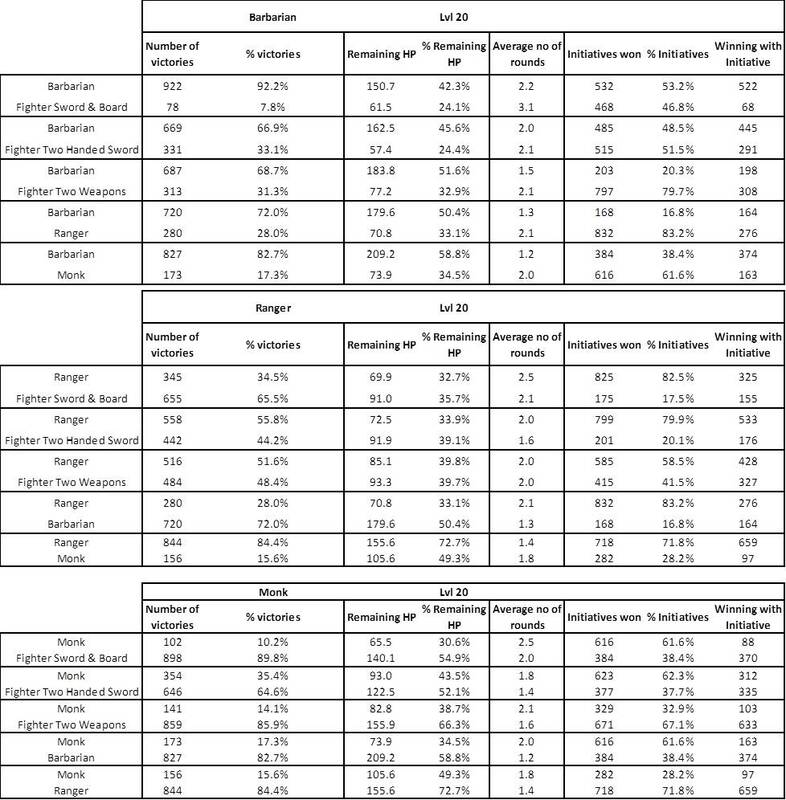 Table 19 shows the averages and consolidated results. The fights are still short, with high damage output by all classes. The information of the consolidated results were used to generate the three graphics presented on Figures 1–3. Once again, the initiative factor is more important than in the previous three scenarios. Most of the fights won by the Ranger, Monk and TW Fighter happened when they had the initiative, while the Barbarian almost did not lose when she had the initiative. Table 18. Results of the fights for the level 20 builds. Table 18. Results of the fights for the level 20 builds (cont.). Table 19. 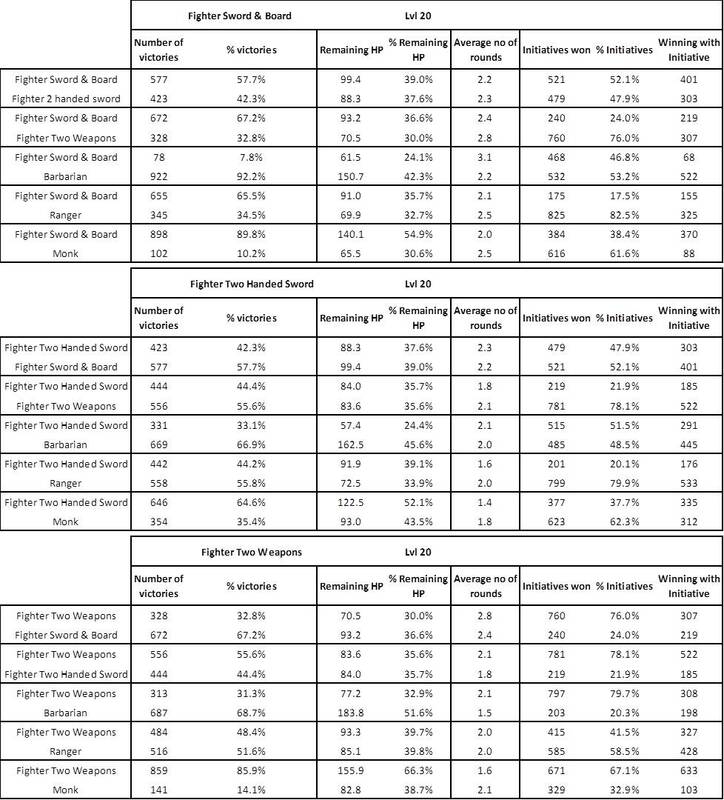 Some consolidated results for the level 20 combats. Figure 1. Number of builds defeated. Figure 2. Total fights won. Figure 3. Average number of rounds taken to defeat the opponent. First and foremost, I find it important to state clearly that the combat is but a small part of the D&D game. Though it might be tempting to create an efficient character for battles, there are many different ways a character can be truly powerful, useful and, most important of all, fun to play with. Secondly, 1×1 melee combats are (thankfully) rare in D&D games. Most battles involve many characters and enemies, making them much more fun and challenging, requiring some amount of team work, planning and creativity. Thirdly, even on 1×1 melee combats, only going for full attacks is not that common. Characters can (and should) have different tactics that involve disarming, tripping, sundering or any other resource that allow them to overpower the opponent. Having said that, this small simulation shows some interesting points. The Barbarian is clearly the strongest build of the ones simulated when considering raw power. The high attack bonus and damage output surpass the most solid defenses, while the enormous amount of Health Points protects against the fiercest attacks. The Barbarian is clearly superior to the THS Fighter, when it comes solely to melee fights. Monks, Rangers and TW Fighters, builds that use a large number of attacks, have trouble against defensive characters, since many of the attacks do not connect. On the other hand, they can consistently defeat characters with low Armor Class, making them interesting choices against Wizards and other spellcasters. The most interesting finding of this simulation, though, is the increasing impact of the initiative on the melee combats, when considering the possibility of a “full attack”, as the characters grow stronger. Due to powerful items such as Boots of Haste and Belt of Battle (or, even better, spells such as Haste or Righteous Wrath of the Faithfull), winning or losing the initiative can be more important than a careful planning of the attack or the careful creation of a character. This might not be relevant in situations where, as stated above, many characters are fighting at the same time, but it can be a problem when 1×1 melee fights affect the whole outcome of the adventure. As such, some adaptations of the initiative rule may be interesting when such fights are necessary (gladiator fights, generals meeting in the battlefield, among others). One interesting alternative is the one presented by the Shadowrun system (Hardy et al., 2013) where, instead of rolling initiative once for all your actions of the round, you roll initiative to define an “initiative gauge”. The character to act is the one with the highest “initiative gauge” and each action taken depletes this gauge by some amount. With the release of D&D 5th edition, many changes were made, including combat rules. Soon enough, I shall play it to give my take on it! Cook, M.; Tweet, J.; Williams, S. (2003a) Dungeons & Dragons Player’s Handbook: Core Rulebook 1 v3.5. Wizards of the Coast, Renton. Cook, M.; Tweet, J.; Williams, S. (2003b) Dungeons & Dragons Dungeon Master’s Guide: Core Rulebook 2 v3.5. Wizards of the Coast, Renton. Hite, K. (2009) Rough Magicks. Pelgrane Press, London. Hardy, J.M. ; Brozek, J.; Croteau, R.; Dynna, M.; Goodman, P.; King, R.; Large, A.; Oratz, D.; Pavao, A.; Ratkovich, S. (2013) Shadowrun, 5th ed. Catalyst Game Labs, Lake Stevens. Stark, E.; Thomasson, C.; Louve, R.; Marmell, A.; Astleford, G. (2007) Complete Champion. Wizards of the Coast, Renton. Wikipedia. (2014) List of Dungeons & Dragons rulebooks. Available from: http://en.wikipedia.org/wiki/List_of_Dungeons_%26_Dragons_rulebooks (Date of access: 01/Sep/2014). Williams, J.P.; Hendricks, S.Q. ; Winkler, W.K. (2006) Gaming as Culture – Essays on Reality, Identity and Experience in Fantasy Games. Oxford University Press, Oxford.